What are the rules? Did people break the rules, bend the rules, or ignore the rules? Confidence in Wall Street went down the drain last week. The credit crisis gave business a bad name, and it gave government a bad name for not doing anything about it. Trust disappeared. It's time to rebuild trust in business and government. Here are ten rules for restoring trust in business and government. These rules apply to everything from the global financial system, to Wall Street; from federal governments to local jurisdictions; from global corporations, to organizations and small businesses. Companies that learn to define transparent rules that are sensible, consistent, easy to understand, and easy to follow will be easy trust. On the other hand, companies that rely on opaque rules that are complicated, confusing, illogical, inconsistent, or deceptive will be hard to trust. They will go out of business. Rule 10 - Have guiding principles. Act on principles, independent of influence by greed or friends. Rule 9 - Follow policies and guidelines about what is permissible and what will not be tolerated. Rule 8 - Establish rules of behavior concerning what is right and wrong. Success in business depends on understanding the rules. The rules of the business are the way the business really operates. Design transparent rules that are logical, sensible, easy to understand, and easy to follow. Rule 7 - Leverage knowledge and judgment. Know what you know, and know what you don't know. Document and retain what your experts know and how they think so their knowledge can be shared with those who need to know. Use wise judgment. Know when to follow the rules, when to bend them, and when to forget them. Rule 6 - Make smart decisions informed by facts, rules, knowledge, principles, and judgment. Decide using clear, logical, and unbiased rules that explain each decision clearly. Use sound reasoning to make rules-based, principles-based, and knowledge-based decisions. Rule 5 - Create enterprise architecture to deal with change and complexity. Use architecture to simplify complexity, and to understand how the whole business and the whole system works; Understand who, what, when, where, why, and how. Design the architecture to ensure that all the parts fit (interoperability), connect (integration), work (quality), work as intended (alignment), last (reliability), and can be shared (reusability). Design the architecture so the business can handle increases in complexity and increases in the rate of change (flexibility). Design the architecture to reduce time-to-market and reduce operating costs. Design the architecture to support rules-based and principles-based compliance. Rule 4 - Do the engineering, to design systems that work, change, and last. Apply architecture and engineering design principles to ensure alignment, flexibility, quality, interoperability, integration, reusability, reliability, compliance, reduced time-to-market, and reduced costs. Build in risk management safety factors so the business and the systems can handle extreme stresses and excessive loads. Rule 3 - Have a clear vision. Stand for brand. Rule 2 - Instill confidence. Improve the quality, consistency, and accuracy of decisions and actions. Rule 1 - Build trust. Align actions, decisions, and transactions with management's intentions. Align execution to goals, strategy, and mission. Align systems to business. Align implementation to intention. While the finance industry is moving toward more rules and exceptions, and rules-based regulation, financial accounting and reporting is moving in the opposite direction, towards fewer rules and exceptions. Accounting and tax is moving towards more principles-based regulation. The US is moving away from GAAP (Generally Accepted Accounting Principles) and towards IFRS (International Financial Reporting Standards). IFRS is the reporting framework used by most of the world today, and it has growing support in the US. IFRS relies on professional judgment rather than detailed rules. Under this principle-based approach, management will have a mandate and obligation to exercise its own best judgment when making decisions. Companies will need to implement systems that use knowledge and judgment to make principle-based decisions. It is time to adopt knowledgebase technology and knowledge management. It's time to build knowledge bases and embed knowledgebased technology into operations and existing systems. and deliver trust. These expert systems can be trusted because they use expert judgment to make the same decisions top experts would make, thus improving the quality, accuracy, and consistency of decision-making. I don't believe there is any other practical or proven way of automating human judgment, other than building intelligent, knowledge-based systems. Knowledgebased systems are the solution for principle-based compliance. Documenting business rules is a good first step on the path towards the business rules approach. But sometimes that's not enough. Taking the next step and getting to the next level requires simulating business rules so they are easy to review and verify. Over the past few months BIZRULES has been working on a new product that lets us do both. 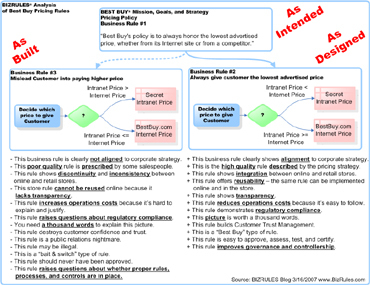 It's a visual tool that lets us not only draw diagrams of business rule models, it also lets us simulate the rule logic. This tool helps us speed up the rules harvesting process and improves the quality of our rulebooks. 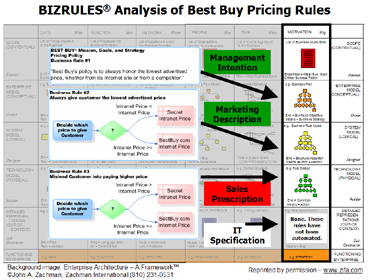 BIZRULES® RuleMap™ is an interactive rulebook that models business rules and simulates business logic. 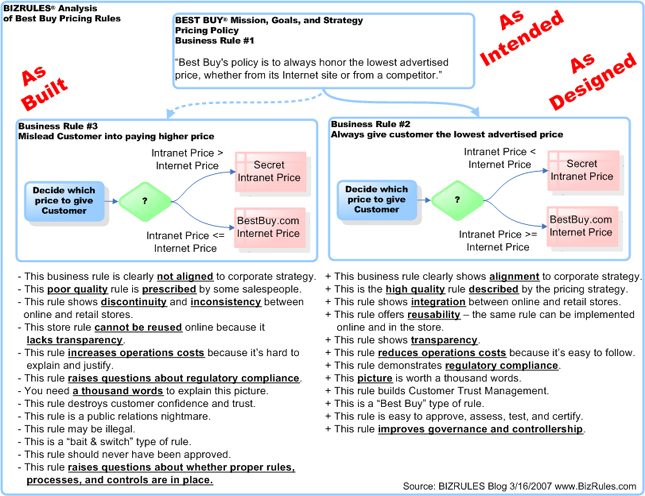 This logical model lets you see how your business rules really work. It lets you visualize the Reasoning Chain™ that leads to smart conclusions and right decisions. We use this tool to document your business rules independent of any BRE - yet it can be implemented using any BRE. Again, this is a logical model of your business rules. It can be used as the rulebook or specs for authoring the rules in any BRE. Take a look at a sample RuleMap. And let us know what you think. Contact us for pricing or a web demo. Say hello to Enterprise Decision Management, or EDM for short. EDM is the new buzzword that business rules folks are buzzing about lately. It sounds like it was dreamed up by marketers to put a new spin on something that great companies have been doing all along, albeit probably manually. In fact, it’s a great acronym invented by James Taylor, Vice President of Enterprise Decision Management at Fair Isaac, to describe what their customers were essentially doing with Fair Isaac’s Blaze Advisor rule engine: Building smart rule-based systems to manage and automate decisions. It turns out that all sorts of companies are using business rule engines to build EDM applications. James just figured this out first and gave it a great name. By now many of the leading BRE vendors are probably updating their marketing materials with the EDM buzzword. Taylor: The book is being published by Prentice Hall Professional, and it describes how companies can use the computer-based systems they have in place rather than purchasing new ones to build smarter systems - and how these systems can help companies thrive through Enterprise Decision Management. James Taylor over at Fair Isaac has a really good list of "Why business rules?" I agree with most of the points, except the stuff about expert systems. Maybe the question should be "why not expert systems?" Of course, everything is better today. And faster. And connected. When expert systems first came out, the Web wasn't even born yet, and PCs were running at 10 mHz. The biggest problem we had at Mobil Oil between 1988-1994 when we were building the Global Expert System Strategy and Lube Knowledgebase Strategy was making and mailing floppy disks to all our affiliates. This is like an intelligent checklist, it never asks un-needed or dumb questions! I like that I can click on an underlined word (a hyperlink) and popup a definition, photo, go to the next page, or whatever! because we're forcing users to fill out information or answer questions on the page (screen), then they have to press enter to go to the next page (screen). That one page at a time metaphor he described was basically how the World Wide Web works. We were doing this in a business rule engine (BRE), aka an expert system (ES) in 1988. Before WWW. Before Windows. Even after the experts retired long ago! Distribution of expert systems, and access, is one of the reasons they "never took off". People used to say expert systems were a solution looking for a problem. Deploying expert systems on the web solves those problems. I think the Web is "the problem" that expert systems were looking for. The Semantic Web is reigniting a lot of the good stuff from the AI/ES days. Adding intelligence and reasoning to applications is what expert systems have been doing all along. And by the way, not everyone agrees that expert systems never took off. I certainly don't. As Richard Barfus, CEO of MindBox, (an ES/BRE/BRMS firm) likes to say, "Expert systems didn't really go away. They went undercover." If employees don’t know, don’t understand, or don’t care what the rules are, you have a business rules problem. If customers get different answers depending on who they talk to, you have a business rules problem. If salespeople can decide whether to charge the right price or a bogus price, you have a business rules problem. Best Buy, the nation's largest electronics retailer, has a business rules problem. It's also dealing with a public relations nightmare, and an investigation by the Connecticut Attorney General's Office. Pricing rules used by salespeople in Best Buy stores are inconsistent and contrary to Best Buy pricing policies established in the boardroom. “What we've learned very quickly is we have not been clear enough in communicating to our employees the policy, and how to execute it in our stores,” said Dawn Bryant, spokeswoman for Best Buy. “Success in the world of business depends on understanding the rules,” I said recently during a panel discussion on Sarbanes-Oxley compliance. “You need to know the internal rules and policies of your business. You have to comply with the external rules and regulations that govern your business, industry, and function. Your company must ensure that rules are followed. Your company must enforce the rules. Your company must give staff tools to help them follow the rules, make legal decisions, and prevent them from making illegal decisions. Business rule management systems (BRMS) and business rule engines (BRE) help companies comply with rules and regulations like SOX. If you don’t have a rule engine that automatically prevents employees from breaking the rules and instantly detects and prevents fraud, you’re out of the game. You’ll end up watching your stock go from $30 to $3 during lunch. You lose. You’re out of business. Smart companies are using business rules to ensure compliance with rules, to enforce rules, to increase agility so they can change faster, to prevent business mistakes, and to reduce IT system development costs by changing rules in days not months. Business rules management is the prescription for business rules problems. Business rules management entails everything from the business rules approach to business rules technology. The business rules approach helps companies transform complex policies into easy to understand business rules. What better way is there to clearly describe and communicate policies and business rules to employees? Business rules technology helps companies execute the right business rules at the right time every time. What better technology is there to automate business rules? What happened at Best Buy is a great example of what can go wrong when business rules are not designed and engineered properly. Business rules are like the glue that holds together all the parts of the corporation. Business rules integrate and align all the moving parts of the corporation. 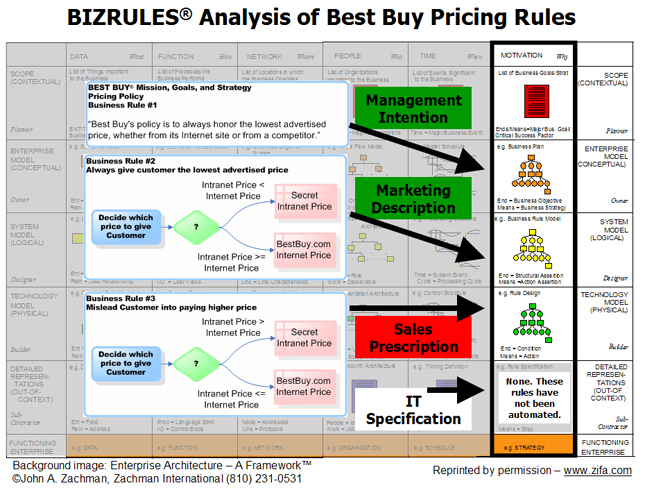 With business rules management, Best Buy can ensure that rules and processes used in the stores are aligned with Best Buy pricing policies defined in the boardroom. Without business rules management to connect the elements of the corporation, the only way to ensure the corporation works as intended is to "hope and pray," as John Zachman likes to say. With weak or wrong business rules, the corporation falls down like a house of cards. This is why business rules management is vital to the corporation. Business rules management is not just about documenting business rules, defining who the owners are, and deciding who is authorized to change them. It’s not just about using rule-based languages to speed up system development instead of hard-wiring rules in legacy code. It’s not just about selecting a business rules engine. It’s not just about understanding the company’s strategies, policies and business practices, and then transforming those objectives into rulebooks, descriptive business rule models, IT specifications, and finally into automated systems. Business rules management is also concerned with architecting and engineering the business rules so they are integrated with the rest of the business. This helps ensure that the implemented business rules that are in actual use, whether automated or manual, align with the governing rules and strategies of the business. What happened at Best Buy? At first, I thought the Best Buy pricing problem was complicated and hard to explain. Then I wondered how can business rules help solve this problem? What would BIZRULES do if Best Buy came to us for help? This is an example of three business rules that were apparently in operation at Best Buy when this story broke. Of course, we really don't know the rules were, so this is just a good guess based on published news accounts of what really happened. Rule #1 is a conceptual explanation of the pricing policy to honor the lowest price. This rule tells us what management means and what their intentions are. This business rule clearly shows alignment to corporate strategy. This is the high quality rule prescribed by the pricing strategy. This rule shows integration between online and retail stores. This rule offers reusability – the same rule can be implemented online and in the store. This rule reduces operations costs because it’s easy to follow. This rule demonstrates regulatory compliance. This picture is worth a thousand words. This rule builds Customer Trust Management. This is a “Best Buy” type of rule. This rule is easy to approve, assess, test, and certify. This rule improves governance and controllership. This business rule is clearly not aligned to corporate strategy. This poor quality rule is operational and being used in stores. This rule shows discontinuity and inconsistency between online and retail stores. This store rule cannot be reused online because it lacks transparency. This rule increases operations costs because it’s hard to explain and justify. This rule raises questions about regulatory compliance. You need a thousand words to explain this picture. This rule destroys customer confidence and trust. This rule is public relations nightmare. This rule may be illegal. This is a “bait & switch” type of rule. This rule should never have been approved. This rule raises questions about whether proper rules, processes, and controls are in place. Management intention is Rule #1. This is Best Buy’s pricing policy. Marketing description is Rule #2. This is what marketing thinks is happening. Sales prescription is Rule #3. This is what salespeople are actually doing. IT specification is not applicable in this example because these rules have not been automated. If these rules were automated, an executable specification of the rule (i.e. pseudo code) may need to be developed for the programmer. These four views of the business rules fit nicely into an Enterprise Rules Architecture. The pricing problem at Best Buy is that the business rule used by salespeople in the stores contradicts the company’s pricing policy. Clearly Rule #3 is not aligned with Rule #1 or Rule #2.
Business rules confusion is what caused the problem. Business rules management is the solution. establish or improve their business rules management. mandate use of Rule #2 immediately. automate Rule #2 as soon as possible. Why let salespeople decide pricing at all? Let the computer figure out what the lowest price is. use a business rule engine to automate this rule as quickly as possible. This rule change needs to happen overnight. But changing hard-wired rules in code takes take days or weeks. Often, companies that don’t use rule engines take months to change business rules as simple as these. This is one reason why companies buy rule engines: Changing rules in a rule engine takes minutes. educate salespeople on the pricing rules. Of course, if Best Buy automated the rules using a rule engine, they wouldn’t need to train as much. ensure compliance with these rules from now on. What about the secret website? Business rules can also help Best Buy get rid of the secret and duplicate website. It's hard enough to maintain and manage prices for thousands of products on one website, let alone two. There are costs associated with maintaining a duplicate site containing 250,000 pages; surely management and shareholders want to reduce redundant costs like these. One way is to use a business rule engine to eliminate the duplicate site and duplicate effort. Why not write a few rules to show different prices (if that really is management’s objective) depending on whether the salesman pulls up the web pages on the Internet or the "secret website" on the Intranet? How else can business rules management and business rules technology help Best Buy? Please comment and let me know. On February 9, 2007 George Gombossy, Staff Writer/Consumer Watchdog reporter for The Hartford Courant, wrote this article on how Best Buy salesmen in the West Hartford, CT, and Newington, CT, stores refused to honor $150 discounts offered on a Toshiba laptop advertised on Best Buy's public website - bestbuy.com. The salesmen justified their refusal by showing the customer a secret website that appeared to be BestBuy.com. This secret website that they accessed in the store did not have the sales price. Best Buy spokesman Justin Barber called the reporter back and said Best Buy's policy is to always honor the lowest advertised price, whether from its Internet site or from a competitor. Barber insisted that "nothing improper was going on and that there was no secret website that virtually duplicates the public site so salesmen can dupe customers." On February 10, 2007 the Connecticut Attorney General's office started an investigation into whether Best Buy maintains a secret intranet site that may have been used by some salesmen to deny customers discounts that appear on the company's public Internet site. The AG's office office informed Best Buy that he wants answers about its Internet policies and to disclose whether it has an intranet site that could be used to mislead customers. His office will also look into whether other chain stores may be using similar sales practices. "The key question is whether consumers were advertised one price, and then denied that price when they got to the store," Connecticut Attorney General Richard Blumenthal said last week. Under pressure from state investigators, Best Buy later confirmed that its stores indeed do have a "secret intranet site that has been used to block some consumers from getting cheaper prices advertised on BestBuy.com." What happened at Best Buy is a great example of what can go wrong when business rules and processes are not managed properly. At a minimum, this is clearly an example of poor business rules management practices and poor process management practices. At a maximum, executives, employees and the company could be liable for damages. This situation shows why business rules management is vital to the corporation. What is the best product that we should recommend for this customer? What is the best solution for this situation? What is our underwiting strategy and policy? What is our pricing strategy for next year? What is our discount policy this year? What promotions should we run? What should we do to improve improve yields and revenue? Where should we locate the new store? Where should we build the plant? Where should we build the product? Where should we hire the employees? What Legal Entity structure should we use for this company? What Legal Entity should we use for this contract? Should we create a new legal entity for this deal? What is the best way to structure this deal? How do we design this plant so as to prevent and contain fires? How do we clean up this oil spill? How do we minimize tax and maximize revenue for this contract? How should we record these types of accounting transactions? How do we calculate this quarter's tax provision? How do we solve this customer's mission critical problem right now? How do we troubleshoot this problem? Thanks to James Taylor at the EDM blog for the idea for this list. If you have any others you'd like to add to the list, please add your comment below. Is the customer eligible for the product? Is the customer eligible for the promotion? What discounts is the customer entitled to? What should I up-sell right now? What should I cross-sell right now? What is the highest available commission (HAC)? What is the lowest available fare (LAF)? What credit card does the customer prefer to use? Do I have all the information I need to save this record in the system? How do I work-around the bug or limitation in the system? Who should we assign as the company contact person for this sale? Every company has Subject Matter Experts (SMEs). But great companies also have what I call Super Experts. Everyone knows who the Super Experts are: They are the people that even the Subject Matter Experts call when they need help making a decision. They are the people that lead executives to seriously wonder, "what do we do if Peter gets hit by a truck?". Super Experts are the "brains" behind key, complex, and high-value decisions. Subject Matter Experts are the people who make a lot of decisions in a little bit of time. These are microdecisions. SMEs seem to know a lot about a few topics. SMEs could easily make hundreds or thousands of microdecisions in a day. Yet each decision is a crucial step in a larger process, such as building a product, making a sale, or taking a reservation. And each microdecision is crucial: A mistake at any point in the process will make the entire entire product, service or process defective. Is this customer eligible for this particular product? What discounts is this customer entitled to for this particular transaction? What is the commission for this booking? What should I up-sell to this customer? What should I cross-sell to this customer? Does the customer want window or aisle? Does the customer want a double bed or king bed? What credit card does the customer want to use? Super Experts are the rare individuals who solve the toughest problems in the company. They routinely make complex decisions, and they make it look easy. Their phone is constantly ringing. A Super Expert is the only one in the company who has the knowledge, experience, and expertise to make the right decision every time. Instead of making a hundred microdecisions a day, the Super Expert worries about making one big decision. Super Experts seem to know everything about lots of topics. Super Experts may only make one decision a day. They may take a few days, or even weeks, to make an final decision. But each decision can save the company millions of dollars. Each decision can determine how thousands of transactions will be handled, and how millions or dollars will recorded in the books. How do we design this plant so as to prevent and contain fires? How do we clean up this oil spill? What will our price program structure look like next year? What will our discount policy be next year? What do we do to improve improve yields and revenue? What is the best product or right product that we should recommend for this customer situation? Who are the Subject Matter Experts and Super Experts in your company? If you are going to work on a business rules management project, one of the first things you need to do is identify who the true Subject Matter Experts and Super Experts are. You need to work with and elicit knowledge from both types of experts in order to succeed.